The US state of Florida offers a wealth of attractions for young and old alike - and can be explored comfortably and flexibly with a rental car from Orlando International Airport! Thanks to our independent price comparison, you have the opportunity to find a cheap rental car at Orlando International Airport in the comfort of your own home. Compare the offers of the car hire companies at Orlando International Airport and start your holiday relaxed and flexible! Orlando in Florida is well known for its many amusement parks. Among other things, the Disney Stars thrill the big and small fans. If you rent a car at the International Airport Orlando (MCO), which you could rent cheaply in advance, you will quickly get to your accommodation at one of the attractions. But also Seaworld, several large malls and film studios are waiting for your visit. Because Orlando is also the shopping mecca for many tourists, as confirmed by the countless outlets and malls. Brands from well-known designers are cheaply available here. In addition, sport is also very important, especially golf courses can be found on every corner. Therefore, it is important for you to be independent of public transport and local tour operators in the city of Orlando, Florida. By renting a car from a local car rental company, which you could rent in advance via the online price comparison on Driceboo.com you can decide for yourself when you want to go where and how you plan your excursions in Orlando and the surrounding area. The Municipal International Airport Orlando (MCO) is of great importance for international air traffic. It is located in the middle of Florida and many cities are easily accessible from here. 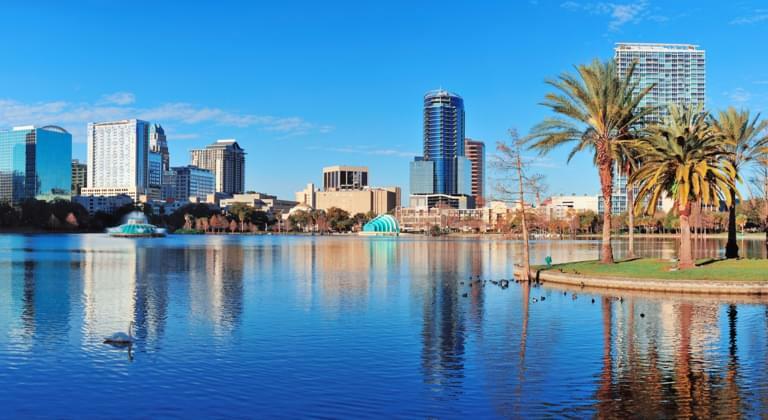 But above all, the city of Orlando itself and its surroundings with its many leisure activities for young and old are also very popular with international tourists. Orlando International Airport (MCO) is quite large with its four halls spread over two terminals, in the USA Orlando Airport is the sixth largest airport in terms of passenger handling. The airport (MCO) is located about 15 kilometres from the city center and can be reached quickly with a rental car, which you could rent cheaply in advance on the Internet. At the International Airport Orlando (MCO) you will be well cared for, because different restaurants, cafés and snack bars offer their food and drinks. The main hall, which houses the two terminals A and B, also offers you the opportunity to shop. Jewellers, libraries, perfumeries, fashion stores, electronics stores, souvenir shops, confectionery stores, a Disney store and above all the Ron Jon Surf Shop, which is obligatory in Florida, offer their goods here, which you can store directly in your rental car at the pick-up station when you make a purchase. The pick-up station for your rental car or motorcycle is located in the International Airport Orlando (MCO) building. This is located on level 1 in both terminals with your counter at which you will receive your pre-booked car from the car rental company. This will take you quickly from the baggage carousels located on levels 1 and 2 to the pick-up station for your rental car. The levels are connected by escalators and elevators. Unfortunately, in the USA it is no longer possible to keep your luggage in a safe deposit box, it must always be carried with you after collection at the baggage conveyor. Since many passengers arrive and depart from Orlando International Airport every day, there may be a short waiting time at the pick-up point for your rental car, which you could rent cheaply via the Internet from home. Here you will receive the key for the car and the necessary papers, the rental car itself is then ready for you in one of the multi-storey car parks, which are easily accessible on foot and by elevator. Where is the nearest petrol station from Orlando Airport? Shortly after the departure from the airport via the feeder road to the streets surrounding the area there are two petrol stations where you can refuel your rented car, which you have found conveniently by comparing the prices, directly after picking it up at the pick-up station of the car rental company. Filling up your car in Florida is different than you are used to. For example, you usually need cash for your refuelling process, it must be paid before refuelling, the petrol station attendant takes the money and sets up the petrol pump accordingly. Credit cards are usually not accepted at petrol stations. If you pick up an unfuelled rental car at the International Airport Orlando at the pick-up station of the car rental company, you should already exchange enough cash in the terminal to use it for the first refuelling. Pay attention to the inscription "pay first"on the dispensers, in which case you will have to pay in advance. In the USA, the gasoline for your car of a car rental company is called "gas" and is refuelled in gallons. Check with the reception of your rental car how many gallons fit into the tank. Orlando International Airport is located only 15 kilometres south of the city centre of Orlando. Via the shuttle car rental from the International Airport to State Road 436, which will take you directly to the city centre. The State Road 525, which can also be reached here via the feeder road, takes you by car in a westerly or eastern direction to the surrounding area and to other cities in Florida. Disney World, the most important amusement park in the area, can also be easily reached by rental car via the 525 and State Road 417. Of course there are taxis and a public bus service to the city, but there is no subway, S-Bahn or regional train. With a rental car, which you could rent cheaply over the price comparison you are independent of these public means of transport and the taxis and can start thus directly into your well-deserved vacation. Which traffic regulations apply in the USA? The traffic rules for you to rent a car from Orlando Airport vary from state to state in the USA. In Orlando and its environs, the traffic regulations in Florida must be observed. The basic rules govern the obligation to wear a seatbelt in a car, which you could rent cheaply through the price comparison. If children travel with you inform the car rental company of the fact that you need the prescribed restraint systems for your car when you book on the Internet. Failure to comply with speed limits can result in fines and even prison sentences. As there is an absolute ban on alcohol in the USA and Florida, you can be arrested on suspicion of alcohol consumption behind the wheel. Caution is advised if you arrive at a crossroads because the traffic lights are always behind the crossroads. There is no right-for-left regulation in the USA, whoever comes first is allowed to drive. It is important for you to know that you can overtake left and right on the highways with your car. Always drive with foresight and caution. What speed limits apply in Florida? The city offers some interesting museums that you can visit with your rental car of a car rental company, which you could rent cheaply through the online price comparison. These include the Museum of Art, the Mennello Museum of American Art and two theatres that await you as an art enthusiast. In addition, a distinctive nightlife also offers a great variety for the evening. You can visit the Cirque du Soleil as well as the Blue Man Group. Every evening in Orlando usually ends with parades and fireworks. Only when this spectacle is over should you get back into your rental car, which you could rent cheaply in the price comparison to return to your accommodation. But if you have booked a room in one of the big hotels, the night isn't over, because the hotels also offer shows and other entertainment for the tourists every evening, but you can also let the day end here in the spa or wellness area of your accommodation. If you travel to Orlando, you don't only want to stay in the city, but also visit the many attractions around the city. In any case, you will need a rental car. So, of course, the large Disney World amusement park is the first place you can reach by car from a car rental company. In addition, there are the many smaller events of Universal Studios, which are an absolute must-do for all film fans. Also on site are the Discovery Parks, of which the exciting SeaWorld is worth mentioning, where you can see the marine animals that are protected. But also the adventure for the whole family, for example in Adventure Island, should not be neglected during your holiday in Orlando. Especially if you rent a car from a local car rental company, which you could rent cheaply on the Internet, you have the possibility to visit and drive to all leisure activities, as well as Legoland, which will amaze not only the little ones. And other zoos and a Dinosaur Park are waiting for you here in the vicinity of Orlando.